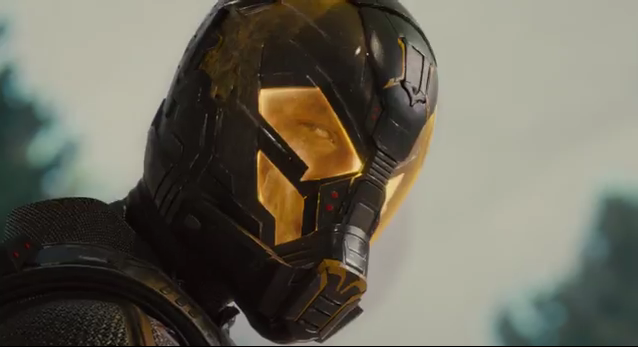 Yellow Jacket is the villain of the upcoming Marvel feature film Ant-Man. The Marvel comics do not have exact version of the character that will appear on screen. Yellow Jacket is a persona used by the first Ant-Man, Hank Pym. Hank goes through a variety of mantles including; Ant-Man, Goliath, Giant Man, and Yellow Jacket. Hank goes through a period of becoming large using the Goliath and Giant Man mantles but finds that growing large takes a great toll on his body. He decides he should start shrinking again. To maintain his crime fighting career Hank begins using the Yellow Jacket persona. The period where Hank uses the Yellow Jacket persona is generally the period where he begins to mentally crumble, he gets married (under bizarre circumstances), grows increasingly depressed and begins abusing his wife and is later kicked out of the Avengers and divorced. Rita DeMara is a small time criminal when she manages to steal Hank Pym's old Yellow Jacket suit. She is captured by Janet Van Dyne the Wasp. When DeMara used the suit to shrink in size she was not mentally prepared for the mass change and she became distraught making her capture by Janet an easy task. She later escapes with a group of other Super Villains and joins the Masters of Evil under the control of Baron Zemo. In this group she masters use of the suit. She eventually turns over a new leaf and briefly serves on the Avengers before joining the future version of the Guardians of the Galaxy. The Yellow Jacket persona has been used by Skrull Imposter and also by Ultron in the Ultimates Universe. Mass change to being super small but gaining or keeping the strength level of a normal person. Yellow Jacket will be the featured villain in the 2015 Marvel release Ant-Man. Yellow Jacket will be played by actor Corey Stoll. The Ant-Man Movie of Yellow Jacket is rumored to be a protege of Hank Pym who has begun to build his own version of Pym's suit. While his suit does work, it also has the effect of the making the user mentally unstable. Pym recruits Scott Lang and a gang of his prison buddies to steal the Yellow Jacket suit.